This program is called "DVD to iPhone Suite" is powerful and excellent software package which combines DVD to iPhone Converter and iPhone Video Converter into one. With the help of DVD to iPhone Converter, you can rip DVD to many popular video formats supported by iPhone and convert DVD to iPhone audio formats like M4A, WAV and MP3 etc. 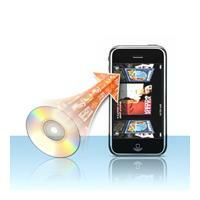 Having iPhone Video Converter, you can convert popular video and audio formats to the ones supported by iPhone.